Last week we were getting ready to leave town for Christmas, so I didn't want to buy any groceries. That meant I had to get creative with what we had in the house. Luckily, I think I keep a pretty well stocked freezer and pantry. I had a couple eggs and some cheese in the fridge plus bacon, puff pastry and blanched kale in the freezer. The resulting meal was good enough that you would have thought I had planned it. Actually, this turned out even better than I expected. The kale was a last minute addition (in an attempted to get more green veggies in us) and really turned it into a more substantial dish. The think that really made this so good though was the bacon, that flavor of smoky, saltiness in each bite made it sing. I almost used breakfast sausage instead and am so glad I didn't. It was a great brinner (breakfast for dinner), but would also make for a lovely breakfast or brunch. 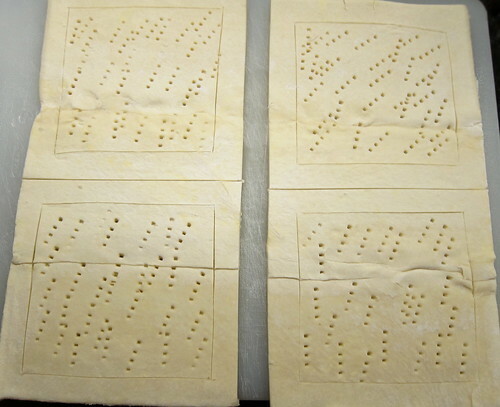 Cut the sheet of puff pastry into 4 squares. Using a sharp knife score a line 1/2" border on each square, be careful not to cut all the way through (if you do when you fill it the egg will leak through). With a fork poke the inner square, also without going all the way through. Put in the refrigerator to chill for 15 minutes. Meanwhile, cook the bacon until crispy. Remove to a paper towel to drain. Put the kale into the same skillet and sauté a few minutes until completely wilted. When the pastry is done chilling, divide the bacon and cheese between the four pastries, placing them in the inner square only. Bake for 8 minutes. Remove from the oven. Press the center squares down to flatten them, leaving the boarders puffed up. Divide the kale between the four pastries. Then top each with an egg. Season with a little salt and a few grinds of fresh pepper. Finally, sprinkle a little parmesan on top. Bake for another 6 - 7 minutes until the whites of the eggs are set. We like it with a soft yoke, but you can cook them as hard as you wish. (You may want to put them under the broiler for a minute. Oh yum, this is like an adult version of egg in a nest. 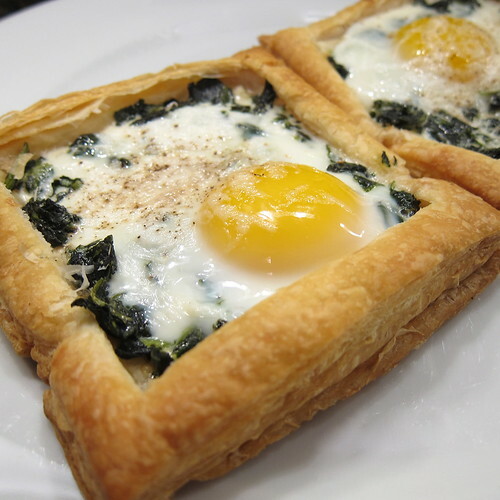 yet another fine use for puff pastry, kat--this is a classy breakfast indeed! This is a great idea. Happy new year! i really need to eat more kale. Vanilla Sugar - My body must be craving it because I've been putting it in everything lately.